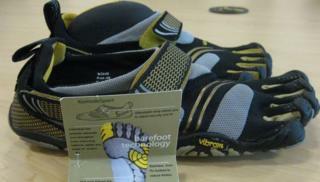 Vibram, the maker of FiveFingers barefoot running shoes, has agreed to a $3.75m (£2.2m) class-action settlement. Vibram customers filed suit in 2012 arguing they had been misled by claims over the health benefits of the shoes. The firm continues to deny wrongdoing, but as part of the settlement has agreed to remove claims that the shoes are effective in strengthening muscles or reducing injury. The settlement agreement is subject to court approval. Customers who submit claims will receive $20 to $50 in compensation. Vibram shoes currently sell for an average of $94 a pair. "Vibram expressly denied and continues to deny any wrongdoing alleged in the Actions, and neither admits nor concedes any actual or potential fault, wrongdoing or liability," said the firm, according to court documents. Valerie Bezdek initially brought the suit against Vibram in March 2012 in Massachusetts, where the firm is headquartered. The settlement funds are available to anyone who purchased a pair of Vibram's FiveFingers running shoes after 21 March 2009. So-called "barefoot" or "minimalist" running has been gaining popularity in recent years, especially in the wake of the publication of a best-selling book on the subject of barefoot runners by Christopher McDougall called Born to Run. As a result, firms like Vibram began manufacturing footwear that aimed to protect feet with minimal interference. Although some runners claimed that they saw a reduction in injuries after eschewing traditional running shoes in favour of the barefoot-style variety, those claims were mostly anecdotal. In 2013, a study of barefoot running shoes found that those runners given Vibram's shoes were at greater risk of injury. "The Vibram group had a significantly greater incidence of bone marrow edema after the training period, while neither group showed any soft tissue changes," the study found, and advised those wishing to transition to barefoot running to do so gradually.